Oberoi Hotels and Resorts has received numerous prestigious awards. The Oberoi brand is synonymous with providing the right blend of luxury, warm service and quiet efficiency to international luxury travelers. 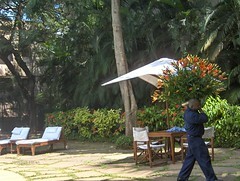 It is acknowledged by business and leisure travelers alike as being amongst the finest in the industry. The Oberoi Hotel, Doha will provide its guests, residents and visitors to Qatar with a distinctive luxury hospitality experience, featuring 225 rooms and suites, 30 serviced apartments in addition to premium outlets for fine dining, leisure and health amenities. Sheikha Hanadi Nasser Bin Khaled Al Thani- CEO of Al Wa’ab City Management- said, “This MOU is a great example of how Al Wa’ab City is consistently aiming at achieving growth and excellence and remaining true to our mission and commitment to being Qatar’s leading real estate developers. The goals we set at the beginning of our project are being realised across the board and our strategies are continuously enhanced to respond to the changing market environment. Oberoi Hotels & Resorts is perfectly in line with our vision to bring home an unparalleled showcase of the most premium experiences”. She further added, “Since the launch of our project, we made sure to build our momentum by defining and meeting numerous benchmarks. To sign an MOU with a group of Oberoi Hotels and Resorts’ exceptional quality and character is exactly the level of association we expect the Al Wa’ab City project to be aligned with. I’m sure this will be a great partnership, we look forward to welcoming the Oberoi hotel in Al Wa’ab City and the city of Doha”. This entry was written by , posted on October 6, 2009 at 4:41 pm, filed under Real Estate News and tagged oberoi hotel, result. Bookmark the permalink. Follow any comments here with the RSS feed for this post. Trackbacks are closed, but you can post a comment.